Before starting to direct a new play or movie, Elia Kazan would purchase a little school notebook and, as rehearsals and early performances proceeded, fill it with his thoughts. 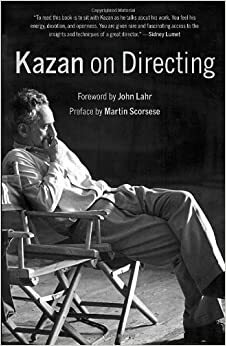 Taken together, these notebooks constitute a unique (and as far as I know unparalleled) record of an uncommonly passionate and acute directorial mind at work and, in edited form, they are the fascinating and unsparing core of "Kazan on Directing." These notes are very writerly. They may sometimes have been scribbled in haste, after a hard day on set or stage, but they are not fragmentary. They are often written in the second person, with Kazan addressing himself as "you." Below are excerpts by Kazan from his book, Kazan on Directing, on writing for the stage and writing for the screen. A director should know everything about playwriting and/or screenplay writing, even if he is unable to write, is incapable of producing anything worth putting before an audience. He must be able to see the merits but also anticipate the problems involved in producing a script. The director is responsible for the script. Its faults are his responsibility. There is no evading this. He is there to guide the playwright to correct whatever faults the script has. At the same time he must respect the merits of the playwright’s work during the tensions of production. He is responsible for the protection of the manuscript. Note that the word is not ‘playwrite,’ it’s ‘playwright.’ A play for the theatre is made as much as it is written. A film is made, not written. They are both constructions. The construction tells the story more than the words. In the movies, the director should be co-author (ideally) because that is what inevitably he is. He should work on the screenplay with the writer from the very beginning. The manner in which the story is developed tells more than the words do. The problems that arise during production are almost always problems of construction. Since so much of the story of a film is told by visual images, the director is the co-creator. A screenplay is not literature – a film is constructed of pieces of film joined together during the editing process. The most memorable films are not usually treasured for their literary values. But in film as well as in works for the stage, story construction is a major component. A filmscript is more architecture than literature. This will get my friends who are writers mad, but it’s the truth: The director tells the movie story more than the man who writes the dialogue. The director is the final author, which is the reason so many writers now want to become directors. It’s all one piece. Many of the best films ever made can be seen without dialogue and be perfectly understood. The director tells the essential story with pictures. Dialogue, in most cases, is the gravy on the meat. It can be a tremendous ‘plus,’ but it rarely is. Acting, the art, helps; that too is the director’s work. He finds the experience within the actor that makes his or her face and body come alive and so creates the photographs he needs. Pictures, shots, angles, images, ‘cuts,’ poetic long shots – these are his vocabulary. Not talk. What speaks to the eye is the director’s vocabulary, his ‘tools,’ just as words are the author’s. Until Panic in the Streets, I’d directed actors moving in and out of dramatic arrangements just as I might have done on stage, with the camera photographing them mostly in medium shot. My stage experience, which I’d thought of as an asset, I now regarded as a handicap. I had to learn a new art. A true artistic partnership between a writer and a filmmaker is an excellent solution, but it’s rarely arrived at. The dialogue remains an adjunct to the film rather than its central element. What can be told through images, through movement, through the expressiveness of the actor, what can be told without explicit and limiting dialogue, is best done that way. Reliance on the visual allows the ambiguity, the openness of life. In the work of the best playwrights there is a mysterious, surprising quality. This play is unlike that of any other playwright. You may realize that the author is dealing with a strongly felt personal concern so important to him that it has been able to arouse the degree of energy necessary to produce a total manuscript. He has something to say; it is his message. The director of a screenplay has to appreciate what the writer is trying to say and stand up for it as surely as if he wrote the words himself. He is responsible for the writer’s theme and must ‘realize’ it, make it come to life for an audience. In film this consists of the choice and arrangement of images. Most screenplays are adaptations of novels, stage plays, stories, news items, history. But the most interesting scripts verge on autobiography. The writer speaks to you, through the screen, using all the means of this form that are special to it, the succession of images as well as words. The best screen work has this element, even if the story appears to be objectively observed. The story is molded by the writer’s beliefs and feelings. The subject of writing for the theatre or screen defies easily formulated rules. The best rule of screen and play writing was given to me by John Howard Lawson, a onetime friend. It’s simple: unity from climax. Everything should build to the climax. But all I know about script preparation urges me to make no rules, although there are some hints, tools of the trade, that have been useful for me. It is essential that the viewer be able to follow the flow of events. If you keep trying to figure out who is who and where it’s all happening and what is going on, you can’t emotionally respond to what’s being shown to you. But keep in mind that the greatest quality of a work of art may be its ability to surprise you, to make you wonder. There’s no such thing as realistic theatre. The very presence of the audience, the fact of selection of any kind, the very taking off of the fourth wall, makes it not realistic. I’m not interested in what’s called realism. I don’t believe I’ve worked ‘realistically’ or ‘naturalistically’ either. What our stage does is put a strong light on a person, on the inner life, the feelings of a person. These become monumental. You’re not seeing the characters in two dimensions. They’re out there living right in your midst. It puts a terrific emphasis on what’s said too. You can no longer pretend a character is talking only to the partner he’s playing with. He’s talking in the midst of eleven hundred people and they’re there to hear him. They can hear his breathing, so right off the bat, the theatrical exists. You can’t duck it. Stage operates through illusion. There’s nothing between the actor and the audience. Only he – without help – can project the idea to the audience. In movies, the camera helps out – moves the idea along. Sometimes it can talk, as it closes in or backs up, helps express emotion, what a character is thinking; or it can anticipate action. The more words, usually the lousier a movie script. Movies must be the real thing. Camera gives the plot an assist, helps the story get there.